Victoria’s Hazelwood power station will be shut down this week after nearly 50 years of supplying electricity. The imminent closure has led to concerns about blackouts, raised most recently by Deputy Prime Minister Barnaby Joyce, and rising electricity prices. So what does the evidence suggest? Last week The Age reported that Victoria is facing “72 days of possible power supply shortfalls over the next two years”. While that sounds bad, it does not mean the state is facing imminent blackouts. This was based on a report from the Australian Energy Market Operator (AEMO), which is in charge of making sure that Australia’s energy markets work. Every week, AEMO produces something called the Medium Term Projected Assessment of System Adequacy. This report assesses the expected supply and demand of electricity for the next two years. In a recent report, AEMO did indeed forecast a “reserve shortfall” for 72 days in Victoria in the coming two years. AEMO has actually been forecasting many days of reserve shortfall, since early November last year when Engie announced the closure of Hazelwood. AEMO has also been forecasting an even greater number of days of reserve shortfalls in South Australia for well over a year. The shortfall forecast is based on a combination of factors. This includes the amount of local energy supply, the import and export of electricity from other states, the maximum daily demand for electricity, and the “reserve requirement”. The reserve requirement is essentially “spare” capacity that can be used to maintain a reliable supply if something goes wrong. If there is not enough supply to meet this requirement, there is a reserve shortfall. Forecasting maximum demand is incredibly challenging and uncertain. AEMO does it by using probabilities. This gives us a measure of the probability of a particular demand forecast being exceeded in a year. For example, a 10% chance would be expected to be exceeded one year in ten. A 50% chance would be expected to be exceeded one year in two. To illustrate the point, AEMO forecast that demand over the past summer in Victoria had a 10% chance of exceeding 9,900 megawatts. In reality, the maximum demand was only 8,747MW. That’s not to say the forecast was wrong, but rather that it was not an exceptional (one year in ten) summer. In the recent outlook, AEMO has found 72 days on which a reserve shortfall might occur. The likelihood of this happening on any one of those days is low. For a reserve shortfall to actually occur 72 times over two years is incredibly unlikely. However, AEMO still plans for this possibility. Indeed, this is largely the point of producing these forecasts: signalling potential capacity shortfalls so the market and operator can respond. What will happen when Hazelwood closes? 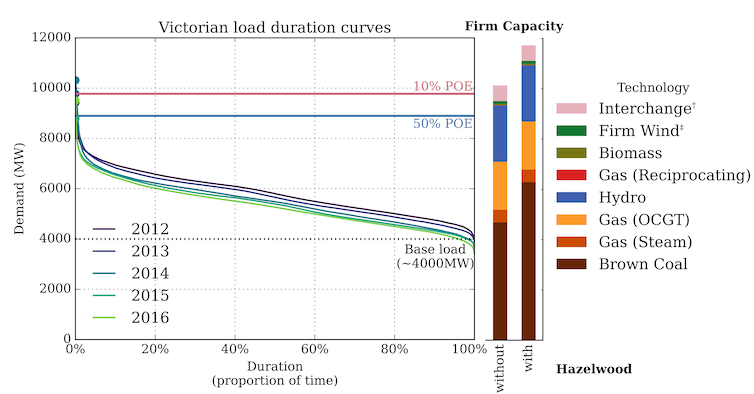 Another way of illustrating the role of Hazelwood and the effect of its closure on the broader Victorian energy system is shown below. In this figure, I’ve plotted the 10% and 50% thresholds for exceeding maximum demand in the coming summer, and also the “load duration curve” for previous years. This curve shows that the periods of greatest demand are also the least common (the left side of the graph). The vast majority of demand is much lower, and the “base load” is about 4,000MW. I’ve also included “firm capacity” (the minimum power we know we can get) with and without Hazelwood, to the right. As can be seen, there is more than enough capacity in Victoria to meet the base load. There is even enough local firm capacity to meet the peak load and reserve requirements for the one-in-two-year maximum demand event. For the one-in-ten-year event, power needs to be imported from other states to ensure secure supply at the peaks. AEMO reaffirmed security of supply in a media statement last week. As noted, Victoria and other states have available power generation resources that are not switched on or are operating at less than full capacity. This electricity can be made available to replace the power that Hazelwood supplies. The question of what replaces Hazelwood brings us to prices. Many, including AEMO, expect to see increased generation from currently underused power plants. These include New South Wales’ black coal power plants. Last year NSW’s black coal was used at 56% of its total capacity. Bumping up these stations’ output would also reduce NSW’s reliance on Victorian exports. Reducing the capacity of brown coal will mean logically that Victoria relies on more expensive forms of generation such as black coal or gas. This is particularly so if the availability of cheap imports is limited, and more expensive local generation such as gas is needed. Black coal power stations generate electricity comparatively cheaply. Even so electricity prices are already so high that an increase in black coal generation may not have a dramatic impact on prices. With NSW prices averaging A$137 per megawatt hour this year, it is clear that the cost of coal is not determining electricity prices. The Victorian wholesale market will also become a more concentrated market. As a result, there may be more opportunities for market power to be exercised. Perhaps the recently announced ACCC inquiry into power prices will put generators on their best behaviour. Any price rise may be short-lived. The Australian Energy Market Commission, which sets the rules for the energy market, has reported that more renewable energy supply is expected to reduce wholesale electricity prices. Hazelwood’s closure should not compromise the security of the Victorian electricity system over the next few years. This is not to say that there definitely won’t be a blackout. A one-in-50-year storm, a plant failure, a flooded mine pit, an interconnector outage – any of these events could strain the system beyond what is manageable. At this stage, what ultimately happens to prices is anyone’s guess. Whatever the case, it is clear that Victoria has plenty of supply to meet the state’s base load. New capacity might be required to meet the maximum demand – and that new capacity could take the form of energy storage.